Unlock the Hardened Badge! Play through fatigue and injury without experiencing a severe drop in skill. Unlock the Spark Plug Badge! Make a big play when coming off the bench or following timeouts to energize your teammates. Pro level dribbling, shooting, dunking, and flashy pass animations will be available for your MyPLAYER. Access to Swag's clothing store and Foot Locker. Unlock the Expressive Badge! Show emotion during the game after a big play. Elite level dribbling, shooting, dunking, and flashy pass animations will be available for your MyPLAYER. You will have the ability to perform celebrations. Unlock the Enforcer Badge! Wreak havoc on the floor with tough, physical play. You will have the ability to create your own jumpshot. Unlock signature emote animations - Tier 1. New clothes from the NBA Store. Unlock the Clutch Performer Badge! Your game will be stepped up in big moments. Unlock Signature Pre-Game Rituals - Tier 1. Unlock Signature Emote Animations - Tier 2. Unlock more clothes in Swag's clothing store. Unlock the Microwave Badge! Heat up quicker than most players. Unlock Signature Celebration Animations - Tier 1. Unlock Signature Movement Animations - Tier 2. Access to Mitchell & Ness Nostalgia Co. sports clothing store. Unlock the Alpha Dog Badge! Be a team leader who takes it upon himself to lead his team to victory. Ever wanted to sit in the GM seat for a bit? You will. Influence the way your NBA team operates, from plays, to rotations, to roster management. Unlock Signature Emote Animations - Tier 3. Bicycle! You can now roam the neighborhood faster by using your bike. Unlock JBL Pro sound studio and JBL headphones. Unlock the On-Court Coach Badge! Call plays, tell teammates to shoot, and call for the ball. Unlock Signature Pre-Game Rituals - Tier 2. Ability to remove your shirt. Who needs a shirt? It will be up to you if you want one. Unlock tattoo designs in Alley Oops tattoo shop. Unlock the Gym Rat Badge! No more gym workouts, and you will always have the extra Energy (Turbo) available. Skateboard! It would be cool to ride a skateboard around the Neighborhood, huh? A new board will be added to your MyCOURT closet. Unlock Signature Celebration Animations - Tier 2. Hoop it up at home. Unlock your own mini-basketball arcade machine for your MyCOURT. Unlock the Championship DNA Badge! Quickly see where the double teams are coming from, and in the playoffs, your game will be elevated. Friends, Friends, Friends. You will have the ability to play games with ANY NBA player on your MyCOURT. Pay Day! All games will earn double the amount of VC. Unlock Signature Emote Animations - Tier 4. Cut the line! Never wait for a game again! You will have V.I.P. Got Next status. Better shades! Special ALL GOLD accessory package will be delivered to your MyCOURT closet. Get your MyTEAM on! Earn several free packs in MyTEAM mode. Be the star! You will be featured on NBA 2KTV for the whole world to see. Unlock the Legend Badge! All badges will be raised beyond normal capability. You will be immortalized in NBA 2K19. 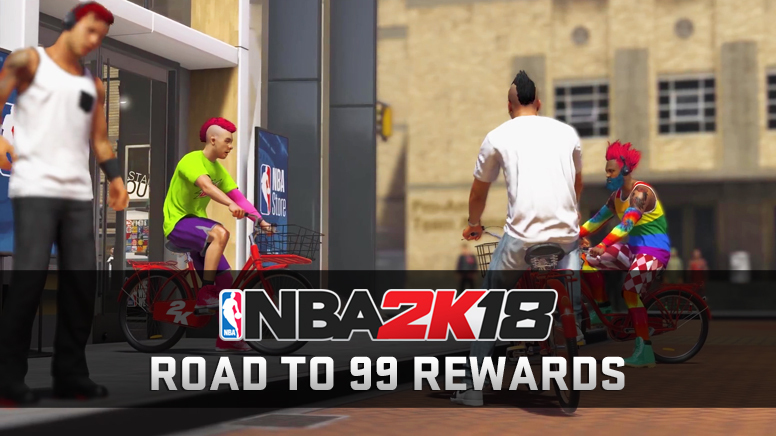 So if you want to unlock badges for your MyPLAYER that will surely help you win games - as well as access to higher tier animations and fancy clothes - then start grinding your way to 99.